Diane Kruger won the Best Actress award at the Cannes Film Festival for In the Fade, and that's pretty much exactly right. I don't know if there was or wasn't a better performance at that festival this year, but I do know that this is the kind of film that, if you're involved in festival jury negotiations, you can make it easy on everybody by giving this one Best Actress and then setting it aside, because there is no way in hell that it might possibly come up for consideration in any other category. Kruger is outstanding in a movie that feels like it's about one-third close-ups of her face, and without her, I'm not even sure what In the Fade would be: some narrative ideas, a whole lot of passionate conviction about the state of the world and what movies can do about it, a few good shots, and pretty much no connective tissue to speak of. 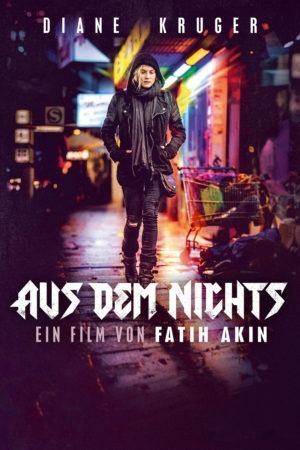 The film's director, Fatih Akin, has spent much of his career exploring the situation of immigrant communities in Germany, and In the Fade takes a new angle on that subject, one that doesn't quite gel. This time the subject isn't an immigrant, but an immigrant's widow. Katja (Kruger) marries imprisoned drug-dealer Nuri Şekerci (Numan Acar) in the film's opening wonderful opening sequence, which takes the form of home movies. Six years later, the couple lives happily in Hamburg, with a darling son, Rocco (Rafael Santana), and a tidy little business that has allowed Nuri to straighten up and become a model citizen. The business unfortunately makes for a perfect target for local neo-Nazis, who blow up the Şekercis' office with a nail bomb. Nuri and Rocco are killed, leaving a gutted Katja obliged to take the stand as the only person who had a clear view of one of the likely perpetrators, Edda Möller (Hanna Hilsdorf). This gets us about a third of the way into the movie, and it's easily the best third; one of the many peculiarities about In the Fade is that it has reasonably clear points where it transitions genres, first becoming a courtroom drama, then a revenge thriller. There's nothing wrong with that per se, of course; it's just that it's not done particularly well. Indeed, one of the overriding characteristics of the film is that it's oddly aimless and shapeless for something that has such an excessively clear purpose. Maybe that's even why it's so shapeless: self-evidently, Akin and co-writer Hark Bohm mean for this to serve as a depiction of the emerging neo-Nazi movements in Germany and elsewhere, and the film writ large provides a human tragedy to make its climactic statistics more visceral than simple numbers. I can't shake the feeling, though, that there's a level at which any ol' human tragedy would do as well as another, and the clunky marriage of disparate genres that the writers settled on was selected more or less arbitrarily. It wasn't a great selection. Akin's strength, across all his best movies (2004's Head-On and 2007's The Edge of Heaven leading the way, for me), is depicting the intersection of people and their communities; storytelling is a secondary strength, and moving into genres hasn't really happened in his work at all, except insofar as The Edge of Heaven is kind of a soap opera. The courtroom material works, by and large, mostly because it remains fixated on characters: Katja's anguish, suicidal depression, and shocked misery; the bored indifference of defendants Edda and André (Ulrich Brandhoff); the melancholic kindness of prosecuting attorney Danilo (Denis Moschitto). It's not in any way new, Lord knows; but there is a stately, authoritative approach to its un-newness. Still, it's a step down from the opening, which paints a much fuller picture of Katja and her family, and captures something of the background wariness of any group trying to avoid being constantly aware that there's a different group that wouldn't mind if they were dead, and which has the cultural clout to make that less than a theoretical problem. And maybe that kind of plotless "there is constant tension in the air because of racism and ethnic nationalism" film would be no less of an art house cliché; I think it might have been an art house cliché that Akin would have been better at making. Regardless, the film ranges from mostly good to very good throughout its opening and middle sections; it's only in the final third, when it tries to become an art film version of Death Wish, that it actively starts flailing. There's a tonal handling that the material needs which it simply doesn't get. So instead of the steady, respectable art film twisting into crass exploitation; or instead of a sober, dour discussion of the validity of vigilante justice; or instead of a quiet celebration that said vigilante justice is happening; instead of any of these things (and they are themselves not all created equal), we just get nothing. The film keeps happening, and Katja prepares to extract justice herself on the acquitted defendants, and there's no sense at all that the movie has an opinion on this, but is content merely to depict it. I frankly think that Akin wanted to go for sordid Death Wish-style exploitation, but doesn't have anything like the skill set for it. Or maybe it's just that I would have enjoyed that the most. Regardless, the film grows very plodding and directionless in its last third. And, to her credit, Kruger almost makes that work. One thing that remains constant in the second and third phases is that she's careful to maintain Katja's crippling depression above all things. She's not motivated by rage, anger, or anything but a sullen, depressed emptiness, and in that sense, maybe "it feels like this should be an action thriller, but really it's just watching stuff happening without inflection" works. Because it seems to adequately capture Katja's interior self. Still, that's giving the film credit for something that isn't really there. Kruger's performance is the best thing in the film and pretty much the only thing that keeps it all yoked together, but In the Fade isn't all that much of a character drama; it's a social issues message movie. This is extremely clear during the trial sequence, and that carries over to the vigilante thriller sequence, and while it's obvious what that social message is supposed to be, the movie's dithering presentation of its plot, its characters, and all those niceties hardly makes the message terribly interesting to engage with at the level of art.